The interactions of tobacco shred with other tobacco-based materials, like expanded cut tobacco, cut reconstituted tobacco and expanded cut stem during co-pyrolysis and co-combustion, were investigated using thermogravimetric analyzer. The results illustrated that the interactions barely existed during the co-pyrolysis, but promoted the combustion during the co-combustion process of all binary mixtures. Oxidative decompositions of solid char for all binary mixtures were promoted by the interactions during the co-combustion process. The activation energy distributions, which were obtained by the Kissinger–Akahira–Sunose method from the TG data, well explained how the interactions influenced the combustion of the binary mixtures. For further understanding the effects of interactions on the combustion behaviors of the mixed materials, the release characteristics of heat, smoke, CO and CO2 were determined by the cone calorimeter tests. Results demonstrated that the interactions among the binary mixtures enhanced the HRR rates and THR values, but reduced the smoke production rates, the amounts of total smoke production and the CO/CO2 ratio. Thus, it could be concluded that the health harm of cigarette smoking can be reduced by blending these tobacco-based materials to some extent. The authors wish to express the great appreciation of the financial support from China Tobacco Anhui Industrial Corporation (No. 2017122). Yıldız Z, Ceylan S. Pyrolysis of tobacco factory waste biomass. 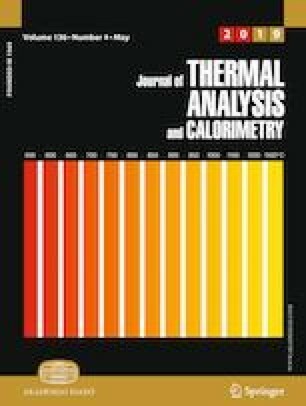 Journal of Thermal Analysis & Calorimetry. 2018; https://doi.org/10.1007/s10973-018-7630-z.